Provided photo Loleta Collins, left, and Carin Benning are the 2018 fall Employees of the Semester at Edison State Community College. PIQUA — Edison State Community College recognized outstanding employee performance at the spring convocation in the Robinson Theater at the Piqua Campus. “These employees make a difference to Edison State and members of the campus community, go above and beyond expectations, excel as team players, and strive to demonstrate the college’s core values,” said Linda Peltier, executive director of Human Resources. Dr. Loleta Collins, director of Student Services and Carin Benning, adjunct instructor, were named the fall 2018 employees of the semester. The honorees were presented with personalized plaques and reserved parking spaces for the upcoming spring semester. Dr. Collins, of New Carlisle, was selected for her commitment to helping the students and staff of Edison State Community College. She often volunteers her time to serve on committees and projects, applying her selfless, can-do attitude. “Dr. Collins makes Edison State better through the various projects and events for which she volunteers,” a nominator said. “Recently, she assisted the Real Estate program by volunteering to help develop all of their courses to an online format, which would not be possible without her selflessness. Her personality, professionalism, knowledge, and mannerisms make her a role model for her department and an invaluable resource for Edison State. Dr. Collins has been an employee of Edison State since 1999 and holds a Doctor of Philosophy in Philosophy and Religion from the California Institute of Integral Studies. Carin Benning, of Troy, was selected for her willingness to go the extra mile when helping students. Benning has been employed at Edison State since 2011 and holds a Master of Arts degree in Applied Behavioral Science from Wright State University. All Edison State employees who demonstrate a commitment to the performance excellence goals, core values, and continued growth are eligible to be nominated for the award. Those eligible for the award are nominated by their peers and then selected by the Valuing People Committee. 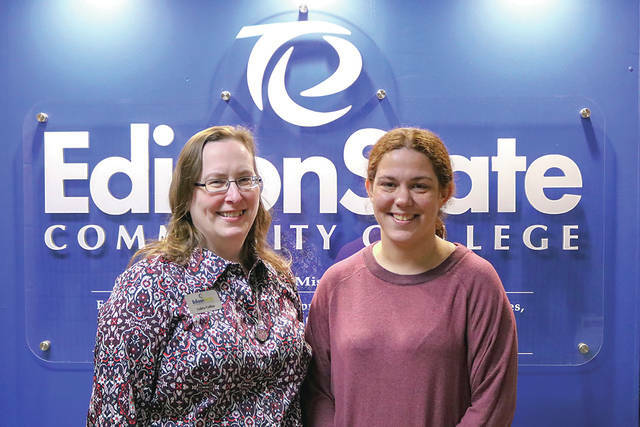 https://www.dailycall.com/wp-content/uploads/sites/30/2019/01/web1_EOS_Fall2018.jpgProvided photo Loleta Collins, left, and Carin Benning are the 2018 fall Employees of the Semester at Edison State Community College.